Those of us who live in the beautiful Okanagan Valley consider ourselves extremely fortunate to live in such a place surrounded by natural beauty, blessed with Canada's best climate, and constantly faced with endless choices of things to do and see. If you already live in the Okanagan, you know what I'm talking about. If you don't already live here I would like to help you find out about the Okanagan and learn about all the great lifestyle choices you can take advantage of. The Okanagan: a slice of the Mediterranean in South-Central British Columbia with rolling vineyards, alluring lakeside vistas and an unhurried lifestyle. The region is rife with romance, and the perfect locale for a dream wedding. This storied valley is located at the northernmost end of the vast Sonora Desert which stretches from the state of Arizona north through Washington eventually ending with the 112 kilometre-long Lake Okanagan. And what a treat for your guests: the Okanagan has so much to offer in activities.The region boasts some of the best recreational opportunities in British Columbia offering a full four seasons of outdoor fun and adventure to add an extra measure of excitement to any event. Hit the greens at one of the 40 regional golf courses; enjoy a glass of wine from any of the dozens of wineries sprinkled from Osoyoos to Vernon; recharge with a cooling dip in the lakes; delight in an unforgettable meal on a houseboat, watching the stars emerge over the water. If you aren't fortunate enough to have a friend or relative with a prime wedding site, there are many wonderful places you can book for your event. Lake Okanagan is surrounded by Canada's finest wine country, with wine festivals in all four seasons. Not only do the wineries make excellent stops on your honeymoon, with tours and tastings, many wineries can be booked for beautiful outdoor ceremonies and receptions. With each wedding season, the region's reputation as a wedding destination grows. 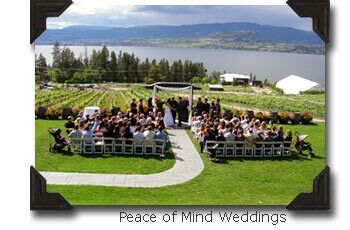 The number of experienced wedding vendors has blossomed and today the Okanagan Valley boasts a full roster of services such as Peace of Mind "day of" Wedding Coordinator that make wedding plans a breeze. Planning a destination wedding? Concerned about long distance obstacles creating enough stress to transform the blushing bride into Bridezilla-and the handsome groom into Mr. Hyde? Fret not. 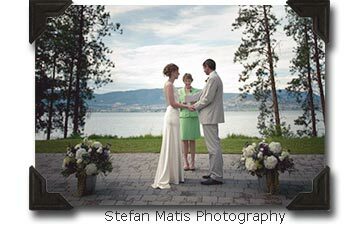 Make it easy on yourself, and consider BC's Okanagan area and Peace of Mind "day of" Wedding Coordinator for a nuptial treat. 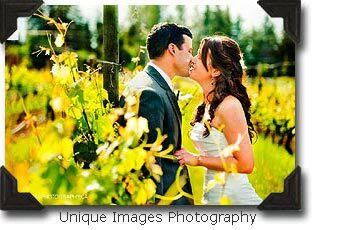 You and your wedding guests will enjoy the unique and varied options the Okanagan offers. There's a little something here for everyone on your guest list. You'll likely want to spend your honeymoon in the area after your friends and family take their leave, but not before they too take in the lush valley, the forests, mountains, lakes, and fabulous weather during the summer months. Couples from all over North America are discovering the Okanagan to combine a unique wedding with a fun, inexpensive resort vacation for themselves and their guests. The recreational opportunities alone are vast; clean lakes with the best in water sports, excellent golf courses, award winning wineries, casinos, fruit orchards, and all that blissful sunshine. 2000 hours of sunshine annually to be exact, with the Okanagan boasting an average temperature of 27 degrees Celsius in the summer, and hovering around freezing in the winter. Not too shabby. Getting there is easy. Kelowna has the only international airport in the southern BC interior. Kelowna International has just undergone a major upgrade and expansion. Most flights into Kelowna offer direct service from many major cities. Driving is relatively painless as well, with four hours on the road from Vancouver, about six hours from Calgary, and five hours from Seattle. Many of your guests will likely appreciate this way of meeting in the middle as being affordable and fun, meaning that most of your guests will RSVP that they'd just loooove to attend, rather than, "Sorry, Hawaii's a little too rich for my blood." contact us and we will show you how.